Strawberry Swing and other things: [Sew Fun] Sewing Challenge Update and DIY Teepee Fun! [Sew Fun] Sewing Challenge Update and DIY Teepee Fun! I'm on a roll, friends! After avoiding the sewing machine, and our sauna of a sunroom where I keep said sewing machine, I'm slowing banging out project after project and have a bunch more lined up! Just got to keep the hot (and sweaty) streak alive. Seriously, it's probably 90 degrees in that room.... skylights are beautiful thing... and extremely hot during a heat wave! After saying near the end of June that I once again failed my sewing challenge of completing a project each month, I snuck in a bib on Sunday, June 30th during Ashlynn's nap. I used my favorite bib, shown below- with a chunky Little A, as a pattern and whipped it up. It was a really quick project which of course, isn't perfect, but it works well enough. I'm hoping to make a bunch more as gifts, since that was one of my twelve project inspiration ideas. I'm going to sketch up a more symmetrical pattern instead of freehand tracing and hoping to snazz them up a bit more with some bias tape, ricrac, or other embellishments. Now, moving on to what you really want to hear about - Ashlynn's Teepee! I can't believe I actually finished it (only 6 months later after declaring I would do ASAP). I'm still waiting for the poles to get another coat of paint and finish drying, so hopefully I'll have it ready to photograph and post as soon as I can. Finished or not, Ashlynn is LOVING it! She runs over and points "Pa Pa" (... teepee??...) and then goes inside and runs out - over and over and over! She's taken her in books, her bunny, and her milk. I hope to make some pillows to layer in there so we can read books and she can eventually have tea parties with her fuzzy friends and real ones alike. Even if she had no interest, I'd be proud of my effort to go handmade, but the fact she's become obsessed with her little hide out has my heart bursting with joy. I made something for her that she loves! One proud momma over here! Hang with me as I get together the tutorial put together! My mom bought my daughter a little pop up tent and a tunnel and she is obsessed with it! I'm thinking I might have to give in to the teepee trend because I know she'll love it and it's far more attractive that the disney princess print on our recent gift. Ashlynn is just the cutest baby, I'm sure you get that wherever you go, but she's just so sweet! I'm still amazed by your teepee sewing skills! Every little person needs a teepee- and A's is seriously so cute and perfect!! Now you need a sign "no peepee in the teepee". haha, too late! She already ran in there to hide out and do her "business" if you pick up what I'm putting down... I thought the whole hiding to drop one came later when potty training starts, guess not! It was pretty hysterical to watch. And totally agree that all kids need one, I kinda dubbed teepee's the new chalkboard after pinterest blew it up and killed it on the trend scale, but like a chalkboard, it's just too much fun. Trendy or not, she's going to have such a blast playing in it! that teepee is adorable! Did you learn to sew on your own or take a class? I am a complete novice! I sewed for the very first time this February when my mom finally brought my machine down when she came to visit. She was a fashion major in college so she taught me how to work the machine, thread the bobbin, change the stitch settings, and very few basics (like the backstitch button, etc). I've done everything by following tutorials from other blogs or youtube when in a bind (like the time my tension got messed up, youtube fixed it!). This is proof anyone with a machine and patience can do it! 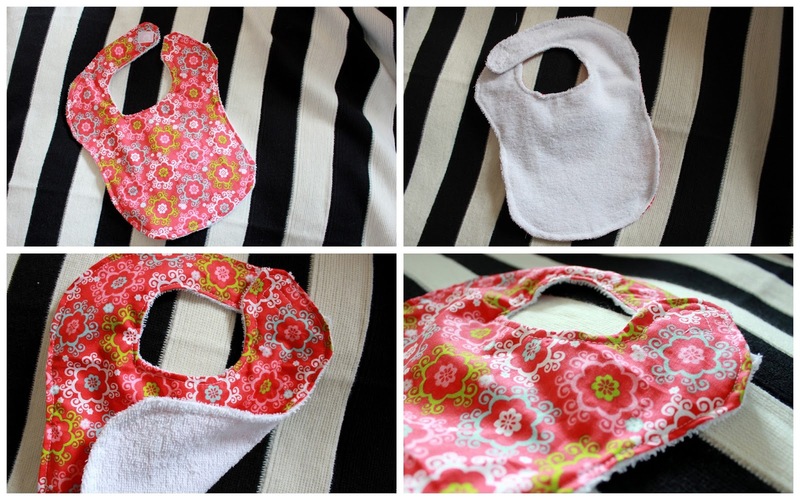 The bibs are so cute and the best part about making them is you can pick the fabric! There are so many bibs out there that have those silly sayings that I'm just not a fan of. The teepee came out great! I want to eventually make one for Aubrey too. Are you planning on posting about the process of making it? Totally agree! I hate catch phrase bibs or ones with overly "babyish" embroidery or logos. Love the custom and having the terry on the backside is great for absorbing drool or wiping any spit up. I am in the process of drafting my tutorial and trying to be as thorough as possible. Hoping to have it posted before the end of the week! So cute about E and cat! Penny ran straight into ours during a thunderstorm the other night, was hysterical. So happy I finally got it put together, worth the time and effort it really is fun for all ages! Girl you're crafty!! Both projects look awesome!! she is SO stinkin' cute! must make teepee stat!